The Adams 3.0 Octave Soloist Series Padouk Marimba is a great marimba for someone looking for a smaller instrument with resonators. 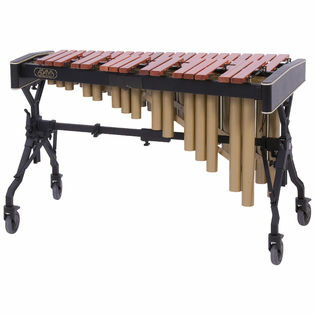 Features a C3 to C6 range and includes a shallow drop cover and mallets. Padouk wood bars offer an excellent alternative to Rosewood, by producing a beautifully warm, woody sound, at a fraction of the Rosewood’s cost. Unlike other student model marimbas, all of the bars within our Soloist Series are graduated in width. They’re slightly narrower than our Artist Series bars, specifically designed to allow easier mallet spreads for beginning players. Like all Adams Marimbas, our Soloist Series bars are precision computer tuned to a level of quality never before available in this price range. Since the inception of Adams marimba production, intonation and clarity of pitch have been paramount considerations. Adams is the only company producing bars meticulously, precision-tuned through an incredible sixth overtone, using a specially designed proprietary computer assisted method. Each bar is hand tuned and adjusted by skilled craftsmen using this proprietary method. This exclusive tuning process gives all Adams marimbas the most stable pitch and evenness of sound available, and allows Adams complete control over all aspects of the marimba’s sound. Soloist Series resonators are welded for strength and noise free dependability, and are finished with a durable powder coated finish. The Adams patented Voyager Frame System is extremely durable and offers effortless adjustment to a wide range of playing heights.